Operating via digital modes is the fastest-growing segment of ham radio today. Applying the power of digital signal processing (DSP) allows hams to communicate keyboard to keyboard, using just a few watts of output power and modest equipment. On HF bands, digital modes must overcome the hostile effect of the ionosphere and atmospheric noise on delicate bits and bytes. Modes such as PSK31, PACTOR, and Throb make short transmissions with robust error detection and correction mechanisms. Limits on transmission bandwidth keep data transmission rates to less than 10 Kbps, but these restrictions have stimulated hams to create interesting protocols. The most widely used digital mode on the HF bands is PSK31. Peter Martinez (G3PLX) invented it — a great example of ham innovation — and developed a complete package of Windows-based software to support it. He generously placed his creation in the ham radio public domain, and hams are adopted it like wildfire. Also, the PODXS Ø7Ø Club specializes in this popular mode. PSK stands for phase shift keying, and 31 represents the 31.25-baud rate of the signal — about regular typing speed. It also uses a new coding system for characters, called Varicode, that has a different number of bits for different characters, not unlike Morse code. Instead of a carrier turning on and off to transmit the code, a continuous tone signifies the bits of the code by shifting its timing relationship (known as phase) with a reference signal. A receiver syncs with the transmitter and decodes even very noisy signals because the receiver knows when to look for the phase changes. PSK31 is very tolerant of the noise and other disturbances on HF bands. In fact, you can obtain nearly solid copy with signals barely stronger than the noise itself. The lighter streaks represent signals, and each horizontal line represents a new sampling of the receiver’s output. New signals appear at the top and slowly drift downward in a waterfall display. Because the bandwidth of PSK31 is so narrow, finding other PSK31 stations on the air requires a pretty good idea of where they are. The most common frequencies are 3580.150, 7035.0, 10142.150, 14070.150, 18100.150, and 21080.150 MHz. Since PSK31’s introduction, several enhancements have been made in the original protocol, including a variant called PSK63 that adds some features and quality improvements at the expense of bandwidth. Morse code was the first real digital mode, but the first fully automated data transmission protocol was radioteletype (RTTY). Commercialized in the 1930s, RTTY (pronounced ritty by hams) uses a 5-bit code known as Baudot — the origin of the word baud. The Baudot code sends plain-text characters as 5-bit codes that use alternating patterns of two audio frequencies known as mark and space, creating a type of modulation called frequency shift keying (FSK). The tones 2125 Hz (mark) and 2295 Hz (space) fit within a normal voice’s bandwidth, so the RTTY signal can be transmitted with a regular SSB transceiver in place of a voice signal. On the receiving end, the SSB transceiver receives the transmission as an audio signal. The text characters can be recovered from the pair of mark and space tones by an external decoder or a computer and sound card running software such as MMTTY. A user of RTTY quickly discovers that the fading and distortion common on HF can do serious damage to characters sent via Baudot code. 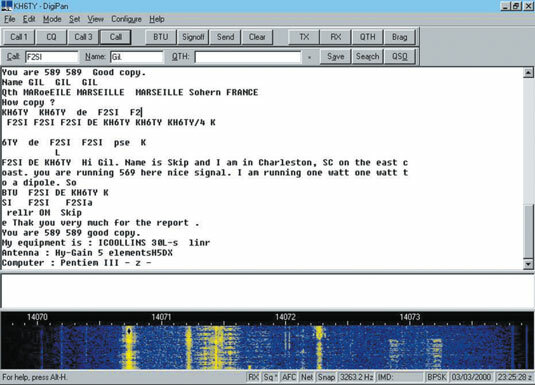 Teleprinting over Radio (TOR) enables radio systems to send text characters. TOR systems include data organization and error-correction mechanisms to overcome the limitations of RTTY. PACTOR goes one step further by adding error-checking packets to the mode. PACTOR II and III add error correction. PACTOR adjusts its speed based on conditions as well. PACTOR III is the most recent release of this technology available to hams. PACTOR III and subsequent versions are available only in equipment available from SCS. WINMOR achieves almost the same data rates as the advanced PACTOR modes and can be used with a computer and sound card; no external controller is required. WINMOR is commonly used in the Winlink e-mail system. Similar data modes include the proprietary family of CLOVER modes. These modes use transmitted waveform shapes and frequencies that are carefully managed to keep the signal within a 500 Hz bandwidth and decrease errors caused by HF propagation. Packet is short for packet radio, a radio-based networking system based on the commercial X.25 data transfer protocol. Developed by the Tucson Amateur Packet Radio group (TAPR), packet can send error-corrected data over VHF links, which led to the creation of novel data systems for hams. With packet, ordinary VHF/UHF FM transceivers transfer data as audio tones. An external modem called a terminal node controller (TNC) provides the interface between the radio and a computer or terminal. Data is sent at 1200 or 9600 baud as packets of variable length up to about 1,000 bytes. The protocol that controls packet construction, transmission control, and error correction is called AX.25 (for Amateur X.25). Some packet systems can also use the TCP/IP Internet protocol. Like wired networks, packet systems are connected in many ways. A packet controller is called a node. The connection between nodes is a link. Connecting to a remote node by using an intermediate node to relay packets is called digipeating. A node that does nothing but relay packets is a digipeater. A node that makes a connection between two packet networks or between a packet network and the Internet is called a gateway.